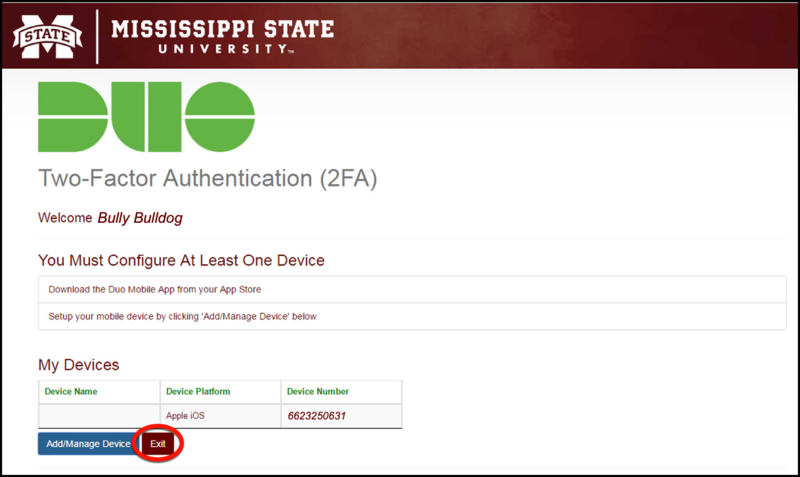 Two-factor authentication via Duo is most often used in conjunction with your smartphone or tablet. If you do not have a smartphone or tablet, you will need to contact the ITS Service Desk. 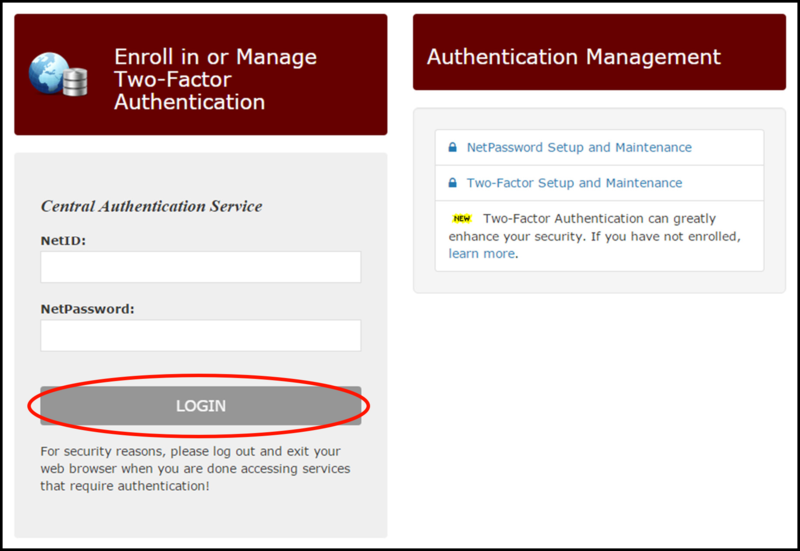 Otherwise, follow the steps below to enroll in two-factor authentication and register your mobile device. You should complete the following steps on a computer with your mobile device available or follow along with the video to complete the whole process on your mobile device. 1. 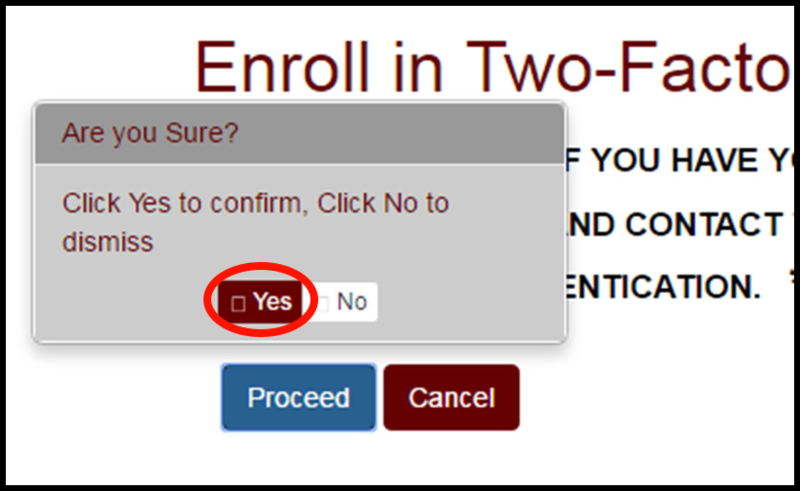 To begin the enrollment process, visit duo.msstate.edu in your web browser. 2. Enter your NetID and NetPassword, then click Login. 3. 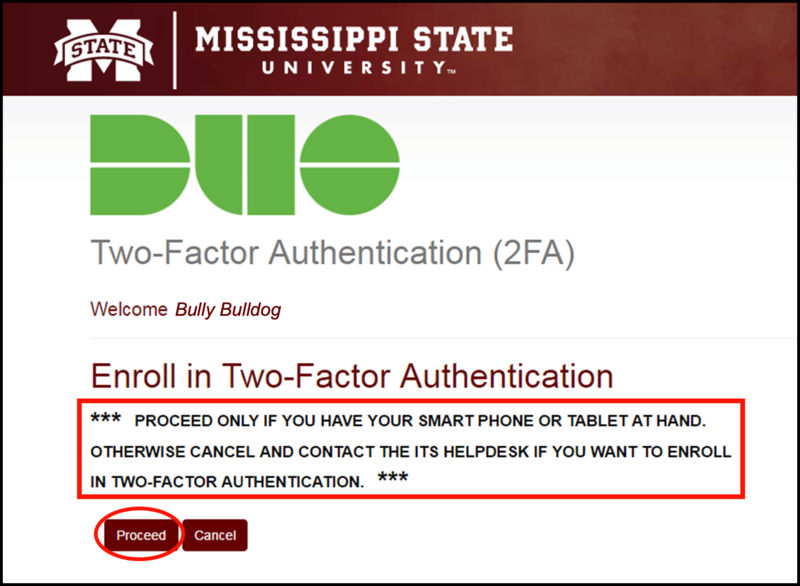 On the Enroll in Two-Factor Authentication screen, you are prompted to have your smartphone or tablet in hand. This is required for 2FA. Click Proceed if you have your smartphone or tablet. Click Yes to confirm. 4. 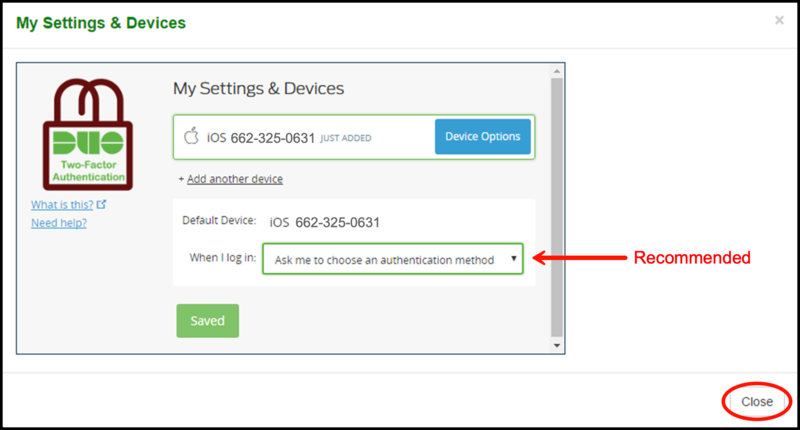 Click Add/Manage Device to add your device. 5. In the My Settings & Devices pop-up window, click Start setup. 6. Choose what type of device to add, a mobile phone or a tablet, then click Continue. 7. If you chose mobile phone, enter your phone number. 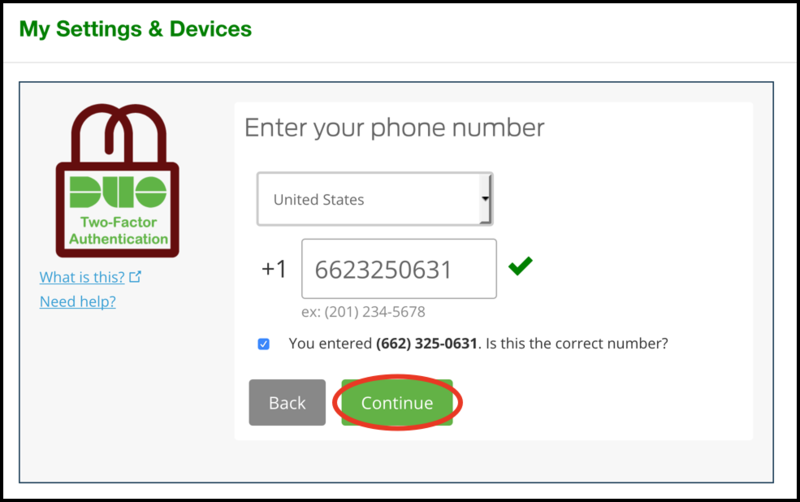 Check the box to confirm the correct number, then click Continue. 8. Choose what type of mobile device you're adding, then click Continue. 9. 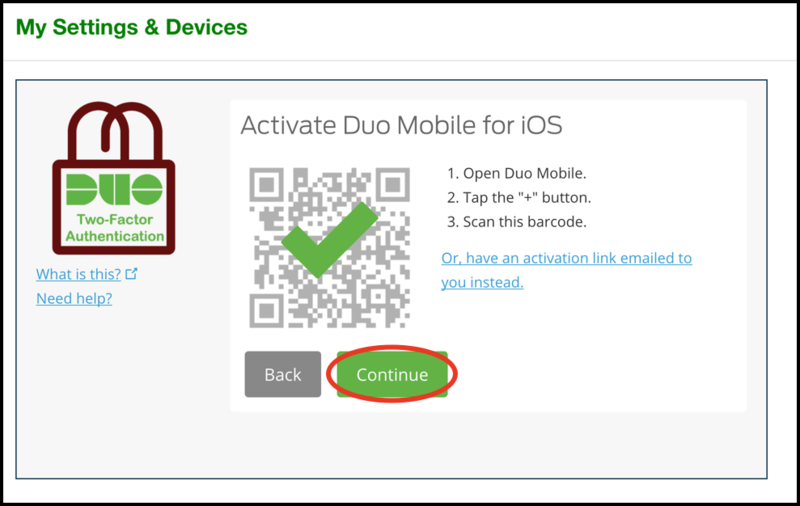 If the Duo Mobile app is not currently on your mobile device, launch the App/Play Store and search for "Duo Mobile," then download and install the app. 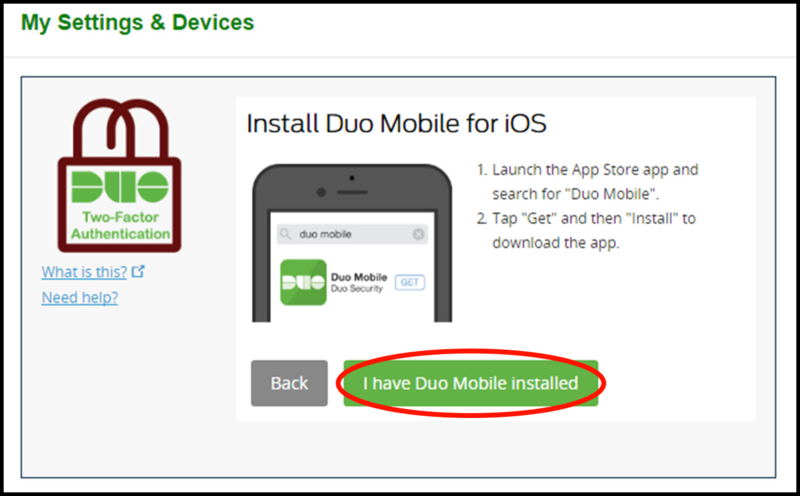 NOTE: For Duo Mobile app installation instructions, see the related articles on this page. 10. Once the app has successfully installed, click I have Duo Mobile installed. 11. 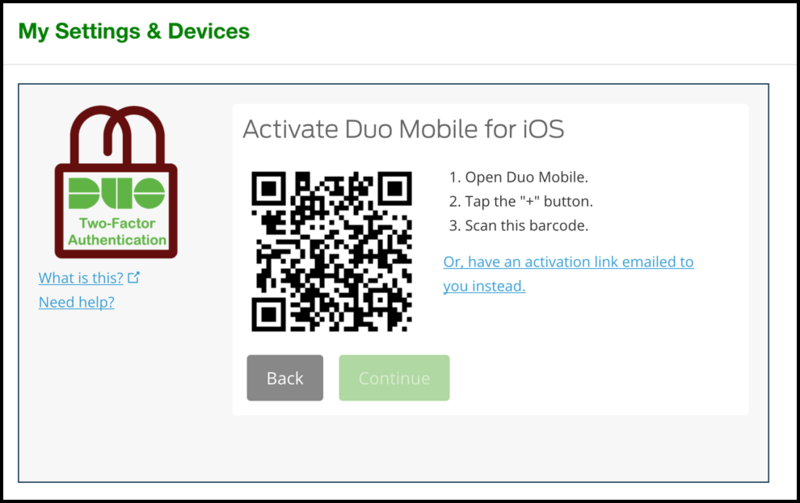 Launch the Duo Mobile app on your device, tap the “+” button, and scan the QR code. Once the code is scanned and your device is activated, a green check appears in the QR code. Click Continue. 13. The final page welcomes you and gives you the opportunity to add another device. 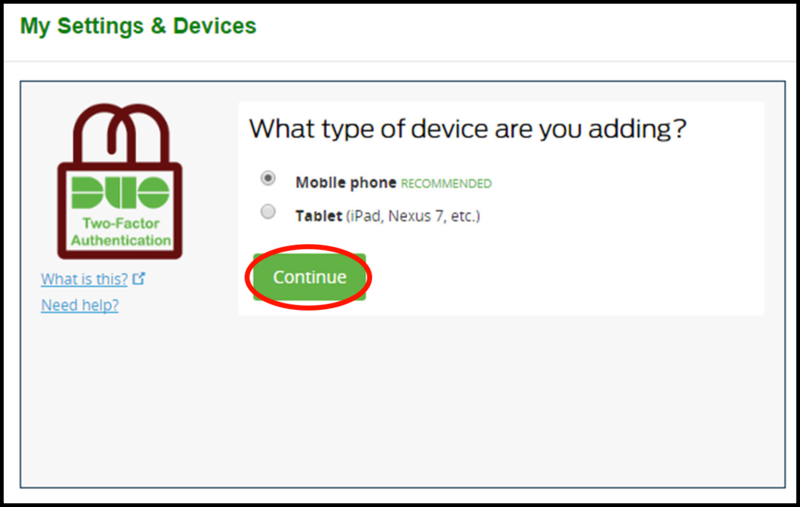 If you want to add another device, follow the previous steps. If not, click Exit. 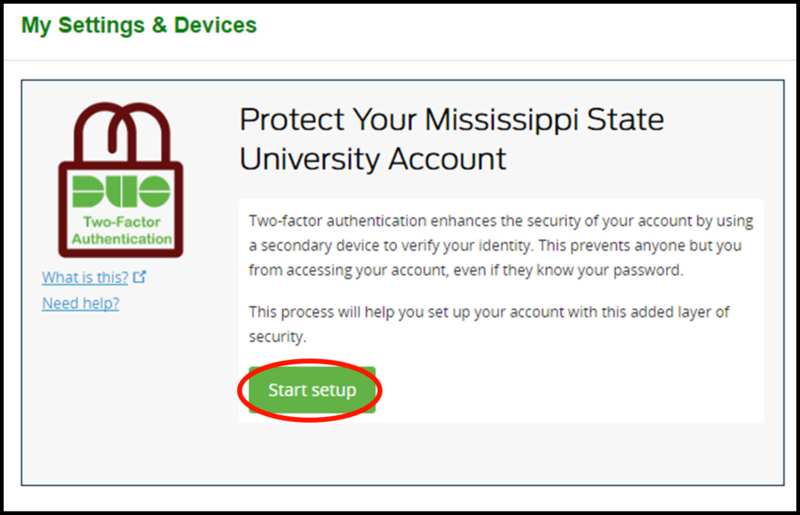 Now that you have enrolled in 2FA, when you login to a MSU system such as myState, you will enter your NetID and NetPassword as usual, then a Duo screen will appear. This screen has two options Send Me a Push and Enter a Passcode. Normally, you will click Send Me a Push. 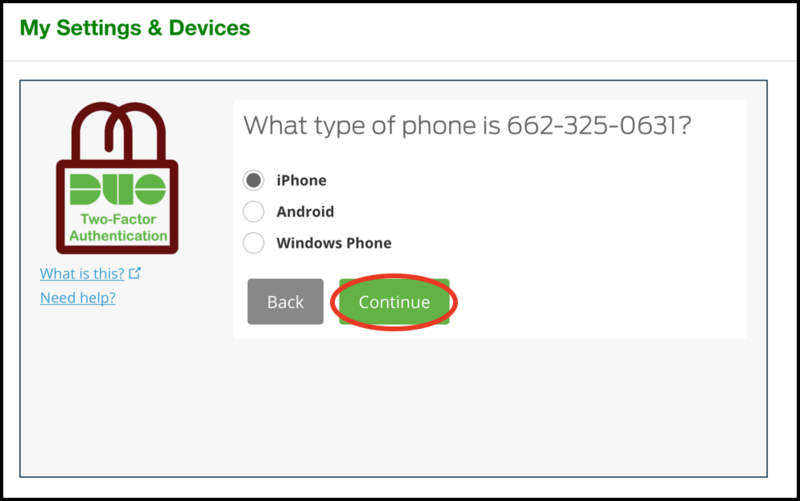 The Duo Mobile app on your registered device will prompt you to approve or deny this login attempt. If this is a legitimate login from you, tap Approve; otherwise, tap Deny. Check out this knowledge base article I found in the Mississippi State University knowledge base. 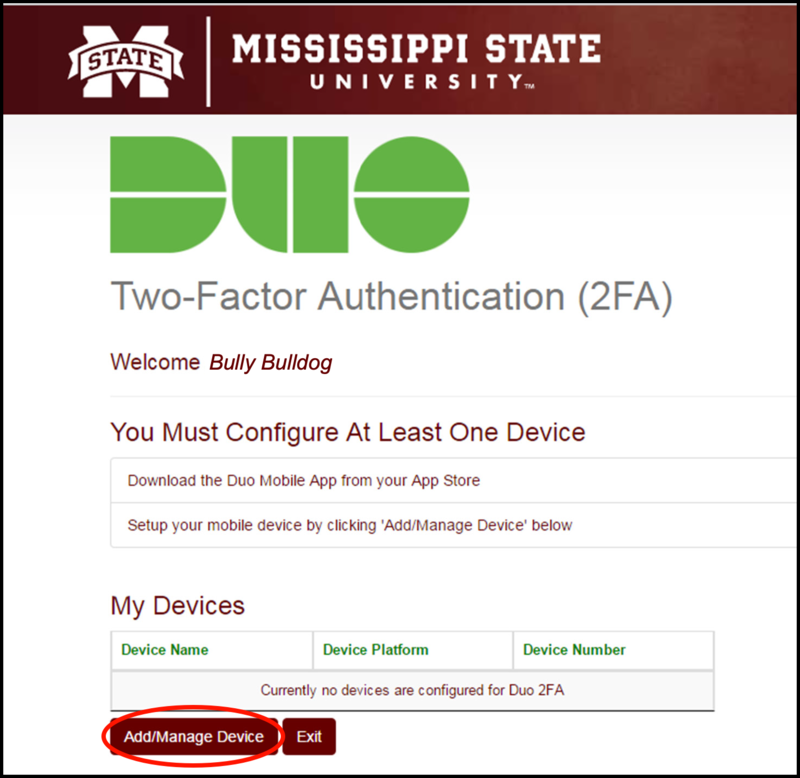 https://servicedesk.msstate.edu/TDClient/KB/ArticleDet?ID=24 Enrolling in Two-Factor Authentication (2FA) Two-Factor Authentication enrollment instructions. Copyright © 2018 Mississippi State University. All Rights Reserved.